There are a few basic types of tattoo machines: coil, rotary, and pneumatic. The magnetic coil machine is a classic machine which uses an alternating electromagnetic current to pass through coils and turn magnets on and off in rapid succession. This pulls a spring loaded armature bar and creates an up and down motion, which results in the armature bar tapping the needles into the skin. Coil machines create the notorious buzzing sound that tattoo shops are known for! Another type of tattoo machine is the rotary motored machine, which powers a small spinning motor attached to an armature, which produces an up and down motion. Rotary machines are much quieter than coil machines and are known to move the needles more smoothly and evenly in comparison to coil. Pneumatic tattoo machines were invented in 2000 by Carson Hill. These machines work through the use of pressurized air from air compressors to move the needles up and down. Major advantages to this type of machine is that they’re lightweight and safe to use in an autoclave. The tattoo needles are set at the end of what is called an armature bar, which connects to the part of the machine that travels up and down. The armature bar passes through the “tube” that has a hand grip attached, which is fitted into a vise on the machine to hold it in place. Some artists use tubes that are made of stainless steel, which must be cleaned and sterilized after each use. The steel tubes are preferable for several reasons, however many artists are switching over to disposable plastic tubes like those shown here for reasons of safety and convenience. The tube is set so that the needles only extend beyond the tip of the tube an appropriate distance. The up and down motion of the needles in the tube create conditions which draw tattoo pigment up into the tube, and allow it to be released when the needles are running in the skin. The assembled machine is connected to a power supply by a special wiring harness called a “clip cord” or “RCA cord”. The power supply has settings which can control the speed of the machines, etc, and is most commonly activated by a foot switch, to keep the tattooers hands free. When the artist is working, they will stretch your skin, press the foot pedal, the machine will run the needles up and down as the tattooer passes the tip of the tube over your skin, the needles carry pigment along as they travel and deposit into your skin where it will stay forever. Think of tattoo needles like individual hairs in a paint brush. All of the hairs in a paint brush are more or less the same, but we all know that paint brushes come in all shapes and sizes. The same is true for tattoo needles. There are some variations available within each size of needle, for instance the taper at the end of the needle may be long, or short, and the needle may be smooth or textured. Other than this all needles are more or less the same. Basically there are “liners” and “shaders”. 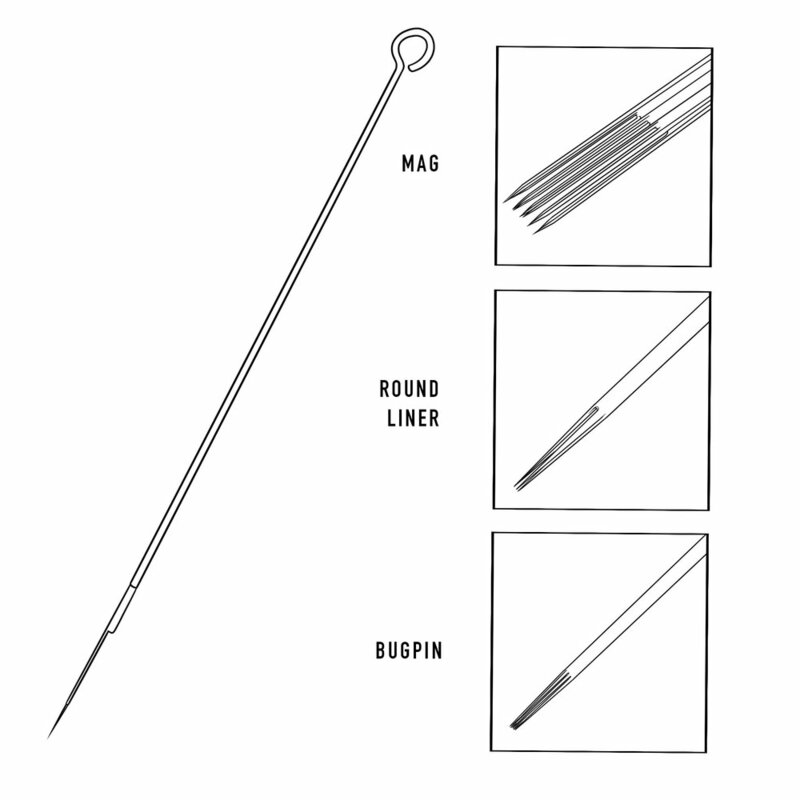 Liner needles are grouped together in various quantities in a round configuration, and are often tightened at the taper so that the points are very close together. Shader needles can also be configured in round patterns, as well as fanned out into what we call Magnums or “Mags”. There are other minor variations and some less common configurations that some tattooers use, but essentially this covers what is commonly used. The individual needles are grouped together and soldered in place to form what is referred to as the “tattoo needle”, the needle is then soldered onto what is called a “needle bar”, which is just a length of stainless steel wire with a loop on the end which can be fitted to the part of the tattoo machine that creates the up and down motion. The unit as a whole is then cleaned, sterilized, and ready to use. The needle bar is placed within the “tube”, a stainless steel (re-useable) or rubber and plastic (disposable) device which provides a hand grip for the machine, that allows the mechanism to function within and through it, and also to provide a reservoir for the pigment. The amount that the needles actually penetrate the skin is about the thickness of a nickel. Any given tattoo artist may work with a range of different needle groupings in order to create their own style of tattooing, it is truly a tiny stainless steel paint brush, and what sort an artist chooses is a matter of preference.